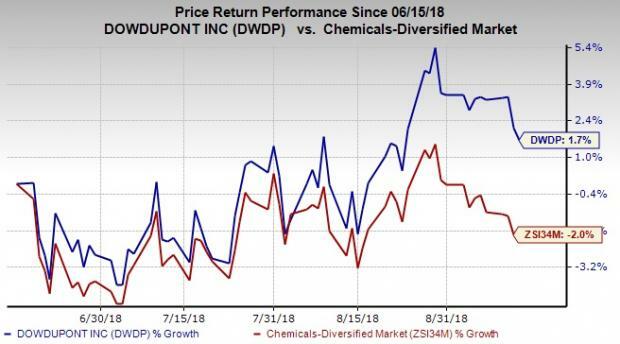 DowDuPont Inc.’s DWDP subsidiary — The Dow Chemical Company — announced high return, low-capital intensity investments in its downstream and upstream silicones franchise. The move is expected to accelerate innovation and support global demand in high growth markets including consumer goods, electrical and industrial, home and personal care as well as high performance building. The investment plan includes a new hydroxyl functional siloxane polymer facility in Carrollton, KY. The plant will provide the latest technology to accelerate innovation and boost the company’s polymer capacity in the Americas by 65%. Moreover, a series of incremental siloxane efficiency improvement and debottleneck projects are included in the plan over the next three years. These projects are likely to increase efficiency and capacity in the company’s siloxane manufacturing facilities across the globe. The investment plan also considers additional expansion projects, which will boost high-value performance silicones products and intermediates, including a new specialty resin plant in Zhangjiagang, Jiangsu, China. The facility will provide resin intermediates for high-value silicone products including pressure sensitive adhesives, home and personal care, antifoams as well as moldable optics for lighting. Per the company, these projects support its ability to meet strong global demand for Dow’s silicones materials. It enables the company to drive innovation and growth along with advancing its leading positions in targeted end-markets. Moreover, the company expects these targeted investments to deliver fast paybacks and higher return on invested capital as well as contribute to cash generation and greater earnings. Notably, the company also started a feasibility study for the construction of a new, world-scale siloxane plant and the geographic location of the plant will be determined on the basis of the outcome of this study. DowDuPont’s shares have inched up 1.7% in the past three months, against the industry’s 2% decline. In second-quarter earnings call, DowDuPont stated that it expects above-market growth through most of its business portfolio on the back of growth investments, geographic reach, innovations and leading market positions. The company realized cost synergy savings of more than $375 million in the second quarter. It now expects to achieve year-over-year savings of $1.4 billion in 2018, a more than 15% increase from the previous target. DowDuPont expects net sales in the third quarter to increase more than 10% and operating EBITDA to rise more than 12% on a year-over-year basis. A few better-ranked stocks in the basic materials space are Ingevity Corporation NGVT, Celanese Corporation CE and Trinseo S.A. TSE, each sporting a Zacks Rank #1 (Strong Buy). You can see the complete list of today’s Zacks #1 Rank stocks here. Ingevity has an expected long-term earnings growth rate of 12%. Its shares have moved up 72.1% in the past year. Celanese has an expected long-term earnings growth rate of 10%. Its shares have gained 13.1% in the past year. Trinseo has an expected long-term earnings growth rate of 12%. Its shares have returned 10.2% in a year.